Do you need closed caption on your TV? Are you lost if you don’t have closed captioning on? Do you avoid phone calls, and prefer to text or message instead? If you or someone you know has trouble hearing, then check out Caption Call. Similar to closed captioning on a television, this will “translate” speech on the phone so it can be understood. This one is near and dear to my heart. I have a hearing loss, and I have a caption phone. It changed my life. Schedule a free installation appointment. It’s 100% free, no charge to use and they give you the phone, free! TIP: if you don’t have a home phone line they’ll give you VOIP (voice over IP) which allows you to make local and long distance calls free too! Do you have a hearing loss and struggle for your family to understand? I wear hearing aids, and in a way I’m fortunate to have family who shares my struggle. Still, it’s really challenging for others to understand that hearing aids don’t fix the problem. It’s not like how eye glasses fix your vision, restoring it to normal or almost normal. Hearing aids do not do that. Life with hearing aids does not sound like life to a person who hears normally! Years ago my wonderfully amazing audiologist, Barb Friedman at the UofM – now Fairview Medical in Minneapolis, shared this life-changing recording with my sister and me. The recording has a man reading a script. Then, they apply a filter to it so that it simulates hearing loss at various levels. They even have an example of what levels of hearing loss sound like when “corrected” with hearing aids. As you will hear, it is NOT like a person who hears normally hears it. And that’s why it’s easier to read it. In other words, closed captioning makes it possible to get what you’re missing. 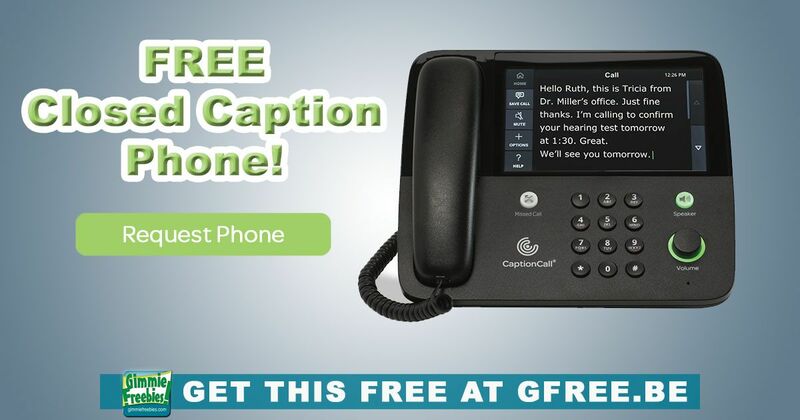 Order your Closed Caption CaptionCall phone, and communicate more confidently with others. The captioning service is provided by CaptionCall and funded by the Federal Communications Commission so there are no costs to the customer. CaptionCall is reimbursed by the FCC for providing the service to individuals with hearing loss. The funds for this service come from a small tax that all United States residents pay on their monthly phone bills for telecommunications relay services. CaptionCall also offers free delivery and installation assistance done by CaptionCall employees located across the country. Our employees have been specifically trained to set up CaptionCall for you and answer any questions you might have about the CaptionCall phone.